The Sandman: Preludes & Nocturnes, Volume One by Neil Gaiman, illustrated by Sam Kieth, Mike Dringenberg, and Malcolm Jones, III, introduction by Karen Berger. From the back cover: The Sandman is the most acclaimed and award-winning comics series of the 1990s for good reason: a smart and deeply brooding epic, elegantly penned by Neil Gaiman and illustrated by a rotating cast of comics’ most sought-after artists, it is a rich blend of modern myth and dark fantasy in which contemporary fiction, historical drama, and legend are all seamlessly interwoven. The saga of The Sandman encompasses a series of tales unique in graphic literature and is a story you will never forget. Preludes & Nocturnes introduces readers to a dark and enchanting world of dreams and nightmares — the home of The Sandman, Master of Dreams, and his kin, The Endless. This first collection of Neil Gaiman’s multi-award-winning title introduces key themes and characters, combining myth, magic, and black humor. My thoughts: Since this is the last week for My Favorite Reads, I wanted to end with something appropriate for Halloween since it is just a few days away. Neil Gaiman is an author who ranks among my favorites and I thought this was a perfect pick to end on. I’m not a comic reader but my husband does pick them up once in a while. I’m not sure how this came into my hands, but considering how much I adore Gaiman’s writing, why not try his comics as well. I wasn’t sure what to expect, but at the end, I was left wondering why I don’t read more of these. The Sandman is a complicated character and I wasn’t sure if I was supposed to feel sorry for him or be revolted. I was both but oddly there’s a human quality to him that also makes you feel sorry for him; although I can’t say that for some of the others in this comic. The family aspect is fantastic as well and what can I say about the artwork. It’s phenomenal. It’s enough to provide guidance in the story but doesn’t anticipate too much so that you stop imagining the story yourself. There are 11 volumes in this series. I haven’t read past Preludes & Nocturnes but it might be time to pick up a few more. 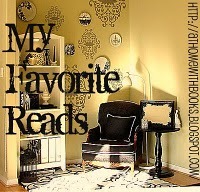 Thanks to Alyce for hosting My Favorite Reads. It’s been fun sharing my favorites. I still haven’t ready any of Gaiman’s work just because I get creeped out very easily. I’ve heard wonderful things from many people about his writing, so I’m sure I will eventually give one of his books a try just to see what I think. You might want to try Good Omens which is more funny than creepy. It’s a great book. Preludes & Nocturnes seems really interesting. It includes the sandman’s kin? hmm.. I wonder what they’re like. I’ll probably go pick that book up before Halloween to get into the spirit. I am just beginning to fully understand my complete love for Neil Gaiman and I can not wait to read The Sandman. Part of me wants to save it for next Halloween and part of me says screw that I’m going to read it for Thanksgiving. Oh decisions, decisions. Excellent to hear. 🙂 I’m planning to buy a few more in this series.